Boardwalk Empire sounds very cool. I find it kind of surprising that HBO would try another big budget period piece after canceling Deadwood and Rome. I'm glad that Hung will get a second season and I also can't wait to see Treme. Wow, Eastbound and Down isn't shooting until late 2010? So it's not going to air till early-to-mid 2011? Bummer. Matt, the article says that Eastbound & Down will film in late winter or early spring (i.e. early 2010), so it could very well be ready to air in 2010. One small correction Alan, I'm pretty sure that Ed Burns isn't involved with Treme. 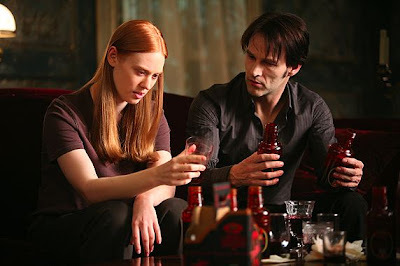 Alan, I don't blame you for not blogging about True Blood (because Sookie is pretty annoying and there isn't much to analyze), but that show is one of the more pure entertaining shows out there, like Chuck. I'm glad it got picked up for a third season. "Little Britain USA," on the other hand, will not be back, but HBO is working on a deal with its creator/stars to do a new project. Thank God for that: The old characters from their BBC show where tired, and the new ones? Well, to put it politely, I've had fits of projectile vomiting that were more amusing. Good on HBO for taking a chance, but its a shame they good on a Britcom bandwagon well past its prime. Both execs figure a third season of "Flight of the Conchords" will happen at some point, but could take a while, since stars Jemaine Clement and Bret McKenzie not only have to write the episodes themselves, but an album's worth of music for it. What a shame that in every interview I've seen with Clement and McKenzie they don't sound terribly keen. Why doesn't HBO sign them up to a development deal, because I'm a damn sight more interested in what these guys do than Little Britain. Is there any indication on what Scorsese's continuing role in Boardwalk Empire will be if (or I suppose, when) the show does get picked up? Just saw your tweets. Why did Thomas Jane get mad at you for that question? He sounds kinda touchy. No news on A Song of Ice and Fire? Any news on the Sarah Michelle Gellar comedy The Wonderful Maladys? Yay for J.B. Smoove returning to Curb Your Enthusiasm! Any word on how many episodes he might in? Love the Seinfeld cast and excited about the "reunion" but probably even more psyched about Leon coming back. Does anyone know what will be replacing True Blood on Sunday nights in the fall? All I've heard about is Curb and Bored to Death, which I imagine will be taking the Hung/Entourage hour. Curb and Bored will air from 9 to 10. I'm not sure what, if anything, will be at 10 in the fall. Guys, I literally listed every show that was mentioned during the session. No talk of the GRRM project or anything else. I think A Song of Ice and Fire is still in the preproduction stage for its pilot. Casting news has been trickling out for the past couple of months (Peter Dinklage as Tyrion, Sean Bean as Ned Stark, etc.) and I think the pilot will be shot soon. Since the pilot isn't filmed yet, it would make sense that there would be no news yet on a pickup. Divya has gotten so annoying on Royal Pains that I have taken to fast forwarding through every scene she is in. Is this deliberate? It would seem a foolish long term strategy. I was not surprised to hear of the renewal of TB, Entourage, and Hung. I thought the Scorsese production was a done deal but I was incorrect. However, I am looking forward to seeing it with Buscemi and Pitt. I'm excited about Treme from the very talented Simon. I can't wait for Curb in the Fall (it seems like it been forever without new episodes). I'm tentative about Bored To Death but will definitely give it a go. I'm not surprised to hear about the news of In Treatment. I will keep my fingers crossed that a 3rd season will come to fruition. Alan, was Life and Times of Tim officially non-renewed? My wife and I loved that animated series. Anon: Tim renewed a while ago, no news ago when in starts up though. I've watched and rewatched the show so many times, I really need some new eps. Nurse Jackie, "Tiny Bubbles": Toast up. Toasting. "This is crazy, this is crazy, this is crazy..."
Entourage: That's it for me! Band of Brothers rewind, episode 10: "Points"
Sports Night rewind: "Dear Louise"